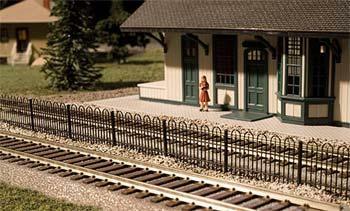 This is an N Scale Hairpin Style Fence from Atlas. It's recommended for ages 14 and over. Retail $6.25 SAVE 23% ! "Looks great, but doesn&apos;t join well"
This kit comes with six 2 5/8 long pieces of fence making a total of more than 200 scale feet in N Scale. It has no gates. There is no way to join the ends of the fences other than gluing them next to each other. The round stands intended for the fence posts aren&apos;t really useful and look awful--so why a 4 star rating? It&apos;s a lot of fence for a low price. The fence is faced on both sides. If you take a lot of care placing them, they can look very nice. TIP: run a line of glue where you want the fence. Place the fence along the line of glue and use pins to hold it upright and around radii. This fence looks very good on my layout. Designed for use with N scale railroad layouts and diorama settings Black plastic styrene construction Easy to assemble with no glue required Loop pickets Spear finials.